In fact, the agreement reached just kicked the can down the road as politicians are amazingly adept at doing. Both parties will lick their wounds and then strengthen themselves for the next round in which kicking the can down the road again will not suffice. Mr. Washington was a Federalist who believed strongly that the central government performed a much needed function to unite, protect and govern the various states. Thomas Jefferson strongly disagreed in a strong central government as he no doubt saw plenty of examples in Europe of large and supremely powerful federal governments. "When the people fear their government, there is tyranny; when the government fears the people, there is liberty," he said. A poll published in the Washington Times on October 9th said 88% of Americans say the "government is in charge of the people"; 94% of Republicans agreed and 83% of Democrats agreed. This week I attended an event at which the former Prime Minister Tony Blair spoke. In referencing the agreement reached at the 11th hour he said that the entire world needs a stable United States. 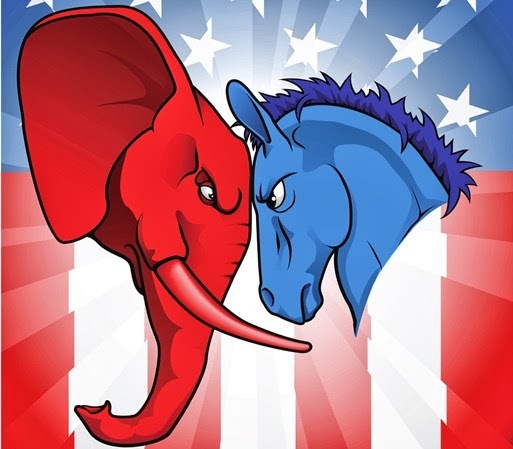 At some point, each of us needs to look beyond whatever political party we may affiliate with and determine as a U.S. Citizen just what is best for the country. Then, with that conviction, we must then hold our politicians accountable to that conviction ... or fire them with our vote if they do not perform. Clint Eastwood had it right when he said during the Republican Convention last year that "we just have to let them go" regarding any politician not doing his or her job. Both Mr. Washington and Mr. Jefferson would likely be highly displeased with the state of affairs today between the executive and legislative branches of our government. George may very well agree with Thomas when he said, "I hold it that a little rebellion now and then is a good thing, and as necessary in the political world as storms in the physical."